Who would have thought a startup which first began as a taxi-booking app in Kuala Lumpur would end up beating ride-sharing giants Uber at its own game? When Grab first expanded into the e-hailing service industry, many saw it as a carbon-copy of Uber and did not think much of it. Today, Grab’s grip on the regional e-hailing service industry is stronger than ever. Before Grab became the e-hailing behemoth it is today, the startup founded by Anthony Tan was first named MyTeksi. Similar to other e-hailing apps, MyTeksi would find the nearest available taxi for a user. Tan, the grandson of an auto tycoon in Malaysia, came up with the idea for the app after hearing his friend complain about the terrible experience of taking a taxi ride in the country. Later, while studying at Harvard Business School, Anthony presented his idea which won him second place at the Business Plan Contest there. In 2012, Anthony finally made the leap and quit his family business to launch MyTeksi with fellow Harvard classmate, Tan Hooi Ling. To get taxi drivers on board, Anthony first met with the owners of all the taxi fleets one-by-one and encouraged them to try his product. “Don’t sell this stupid app. Nobody will use it,”, said Anthony as he recalled Grab’s humble beginnings in a press conference in 2014. Anthony would also take the time to reach out personally to taxi drivers, by approaching them at places where they usually flocked to such as airports and taxi queues. After gaining success in Malaysia, GrabTaxi expanded to the Philippines, Thailand, Singapore and Indonesia within the next two years. It was not until 2014 that Grab adopted the e-hailing approach, which allows users to hire private cars. Ever since then, Grab hasn’t looked back. Grab has since taken several approaches to carve its own space within each country. Unlike Uber which transplants its American model into different markets, Grab is privy to local nuances. In cities such as Jakarta where traffic jams are notorious, Grab introduced GrabBike to circumvent the obstacle. GrabBike services have also just been launched in Cambodia and Thailand. More recently, Grab started testing a tuk-tuk service called “Grab Tuk-Tuk” in Phnom Penh and Siem Reap. Industry experts have argued that Uber’s refusal to engage with local markets is the main reason behind its demise in Southeast Asia. Now, Grab is present in 168 cities across eight countries and is estimated to be worth US$6 billion, thus achieving the coveted unicorn status. As of late however, Grab has become the victim of its own success. Uber’s exit from the region inadvertently meant that Grab had established a monopoly. Regulators in several countries such as Vietnam, the Philippines and Singapore have looked into the matter. Meanwhile, consumers have begun criticising the company, claiming that prices have increased ever since the Uber deal. Experts argue that it would make sense for Grab to charge higher prices now as it needs to recoup the losses made when it was charging customers lower prices to eliminate the competition. Responding to such criticisms, Grab has maintained that all its fares are determined by supply and demand. Not satisfied with monopolising the e-hailing market, Tan has his sights set on other industries as well. Grab is currently expanding its food delivery service – another trend that has taken the startup industry by storm. 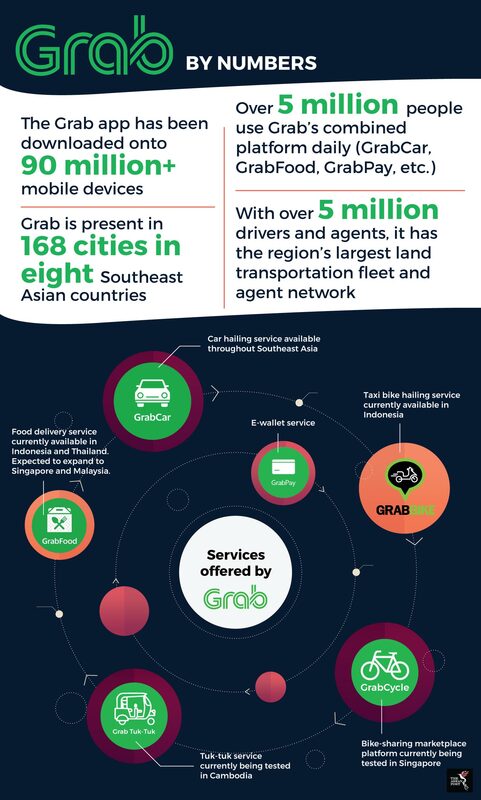 Grab recently launched GrabFood in a handful of countries including Malaysia, Thailand and Singapore, and is looking to expand to six of its core markets in Southeast Asia. Grab also plans to capitalize on the region’s unbanked population by launching GrabPay, a mobile wallet service that allows users without bank accounts to buy top-up cards and to put money into their accounts. Aside from being integrated with other Grab services, people can also use GrabPay to pay for items and services at outlets which support the platform. Most recently, Grab announced the launch of its accelerator and investment unit called Grab Ventures. Uber may have vacated the e-hailing throne but Grab’s dominance over the regional e-hailing market is not as strong as some might think. One of its biggest competitors, Go-Jek has already announced plans to expand to other countries in Southeast Asia as well. There are also a number of new startups that are keen to fill the void left behind by Uber’s departure from the region too.